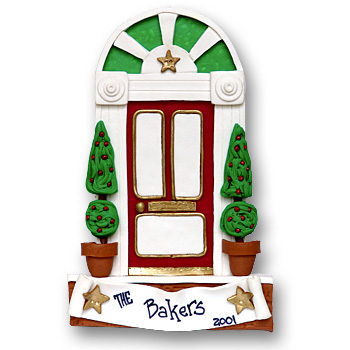 Our elegant style door is the perfect personalized gift for any family. It has a very "Stately" feel to it. The topiaries framing the door give it that touch of elegance. It is designed by me. I am more than happy to personalize it for you with a names and year absolutely FREE!. Just e-mail me with the instructions. Personalization is also hand done.